Buy 2, Get 1 FREE! There are plenty of days when all we want is a little peace and time to ourselves. While we cannot guarantee our product will bring that, we can guarantee that these headbands will look great with whatever you wear and take the agony out of deciding what to do when that bad hair day hits. This package includes our Bohemian Bliss, Star Gazer, and Solidz Twisted Teal. (The Twisted Teal Half Hoo can only be found in this package). New to headbands. Really love these, the color, comfort, and versatility. Love the variety of patterns and colors. This was my first purchase from Hoorag. Loved this little package and thought it was pretty. Much better priced than some competitors, and great quality. I also bought the mystery Hoo and received the Memorial Day poppy full Hoorag as a gift. Well, my children loved them too and absconded with the mystery and full Hoorag. Guess I’ll have to be back to buy some more!!! I love these! Best headband I have ever tried. Stays on my head, wicks away sweat, and protects from the sun. These are great! I love my Half Hoo Headbands! They are just the right size to use as a headband. No bulk. I was worried that they would either squeeze my head too tight or be so loose they would slide down in the middle of my workout. I will certainly recommend them to my friends. Awesome headbands!!! I’ve worn them on the trail, treadmill and lifting weights. The colors are beautiful and they don’t slip or give me a headache. So happy with my purchase!!!! Half Hoorags are my new favorite thing. I work really hard in the summer and need something to keep me from looking like a sweaty lady. The material is light, helps keep the sweat at bay and looks pretty awesome. I’m a big fan of these! 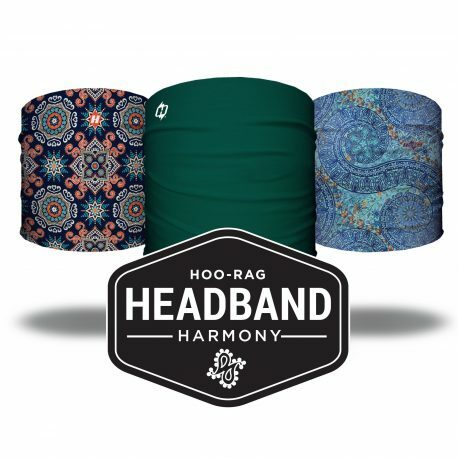 The half Hoorags are my new favorite headwear. I wear them to hike, run, cycling and for every day. They stay in place and absorb moisture well. Plus the variety of colors and patterns make them super fun to wear! I recently did and overnight hike on Mt LeConte with several family members. Of course I took several choices of half Hoos. Two of my female family members loved them so much they ended up borrowing a couple to wear themselves! Love! Perfect size and material and awesome patterns!!! Love them! Great color and patterns. They work great to also keep my ear warm in the cold Montana winter! I am a big fan of head bands when I run or bike and am always on the look out for great brands. Love the hoorags in 1/2 size. Stay on my head, are soft and not so heavy as the full size. Love it! Color and patterns are fantastic! These are my first 1/2 hoo headbands. I have several of the full ones. I really like them. The full ones are nice when I run and need something to cover my face and ears. My new 1/2 Hoo headbands I wear to the gym. They are nice and fun enough to wear after the gym. I really like the combination of colors. I have tons of hair and they aren’t to tight. I will be getting more. I loved all three of these colors/patterns! I’ve had trouble finding headbands for workouts that doesn’t cause headaches….well I found one! Hoo-rag’s are the first headband, after a long search, that fits all, washable, and easy to put on! This will not be my last purchase from Hoo-rag! I love these. I wear them while I cruise in the truck to keep hair out of my eyes. I also wear them to work in a professional setting as a headband. They are great for the summer at the pool, lake, or beach. I have washed and dryed mine. There is no fraying or shrinkage. I loved this package deal and the product too! It does not give me a headache, it stays in place, and they don’t bother my ears like others do if you wear it down over your ears while on the motorcycle. I just ordered a full size hoorag to see which I like better. Can’t wait to try them under my helmet when we go to OCMD Bike Fest in September. Wish I had tried them sooner. They really stay in place. Call me a Hooligan!! ? Love, love, love the half Hooligan headbands! They definitely absorb…which is what I needed when out in the hot, hot, hot Texas sun! Great product!